We continue to grow and expand the range of innovative solutions to meet our customers’ demands. We are ahead of trends and create solutions that have so far been inaccessible in short quantity runs. Our machinery resources are not only printing presses. We believe in innovations and that it should be easily accessible. See below for examples of solutions that are available to all customers. If your idea is not on the list, it might be that we are working on it right now. Check us out and contact our Sales Department to discuss the details. 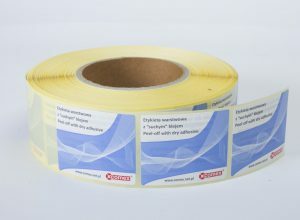 Labels with adhesive-free strip. 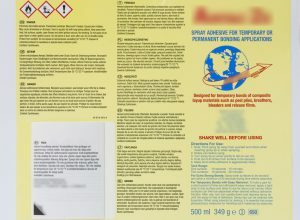 Adhesive is applied on a printed label only in the selected sections (e.g. adhesive is applied to the top and bottom section with an adhesive-free strip in the middle). For promotional campaigns it is important to ensure that any attempt to read the information printed on a label is made apparent so that multiple use of the label (e.g. of a promotional code) is impossible. A label with an adhesive-free strip is the best response to this requirement because in order to read the information inside the label it needs to be torn along the perforation and cannot be replaced. We offer adhesive-free strips for both single and multi-layer labels. Contact our Sales Department for more details. 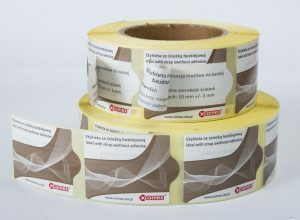 Labels with dry adhesive. This special type of adhesive is applied to a printed peel off label in between two layers. Once the top layer is peeled off it cannot be re-applied as the adhesive becomes deactivated, leaving the user with a non self-adhesive coupon. The bottom layer remains adhered to the product. This solution works well if the top layer of the label is to be used independently by end users, and therefore needs to be seamlessly peeled off from the base label. This is an ideal solution for discount coupons, where the barcode or variable alphanumeric code are printed on the reverse side of the top layer. 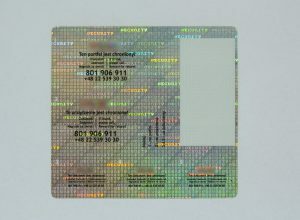 The adhesive that spontaneously deactivates once the layers have been peeled off makes it possible to write on the label with a ball pen or a fine-tip felt pen, providing sellers with a means of communicating with end users. Production of specialty and dedicated substrates. We do not consider a lack of self-adhesive substrate in a manufacturer’s offer to be a problem. Unusual paper density, substrates from laminates or multilayer substrates that ensure the barrier effect are available to all customers. Choose your best-in-class material, adhesive and liner while we prepare the substrate – as simple as that. The choice we provide to our customers is not limited to commercial self-adhesive substrates. Instead, we offer a full range of non self-adhesive substrates that can be used as self-adhesives. Not only do we print labels, but we also produce substrates and deliver unusual solutions. We make the most unusual self-adhesive substrates. If you are looking for a dedicated solution, you will find it in our portfolio – just contact us. Labels featuring an application is a story of how we save our customers’ time and money. Comex can offer proven solutions in the simplest form for application. If your product requires a label with booklet, we can easily deliver a 2-in-1 solution and ensure that the labelling time will remain the same as before. If you need an additional small application (e.g. a scented label, price label or a registration key) on your main label that can be peeled off without compromising the integrity of the main label, or if you need your label to hide a ‘surprise’ (e.g. stickers for kids), together we will discuss all the details to make sure that the extra items do not generate extra costs during application. Adding extra items does not necessarily have to generate extra costs during application. By combining several elements or products (e.g. a booklet and a label) customers do not need to worry that the time of application or their own production cycle might double. We know everything about security and we provide the best solutions. We know what type of problems our customers are facing: fake products, originality marking, lack of tamper-evidence, assigning individual certificate or code, security seal, marking the evidence of use. We know the answers to all of these problems and will help you choose the right solution. The security Comex provides is not limited to holograms, special inks, microprint, personalization codes or chips. We also use specialty substrates and our production process is supervised. We implemented separate quality procedures to support promotional campaigns and special production requirements. Processing of orders that require special supervision is fully documented at each production stage, and the disposal of production waste is documented by issuing a waste disposal certificate. Not only do we deliver securities, but we also manage them. No lamination labels with abrasion-resistant print. The technology of printing on the underside of a transparent foil allows us to produce a label with the printed area that is protected against abrasion and external factors, thus eliminating the need for lamination. This solution is more cost-effective compared to laminated labels. Besides higher resistance, the print is also more saturated as light passes through the clear foil. This technique is especially recommended to customers whose products are at risk of mechanical damage in transport or caused by usage. In addition to that, print on the adhesive side protects the final product against forging. Double sided label without limitations. Keeping in mind stronger demands of the market and our customers, we have expanded our product portfolio to include double sided full colour printed labels. The outer layer print enrichment is an example of how to make glass or transparent packagings stand out on a store shelf. Alternatively, additional print that shines through the outer layer can be applied on the reverse side of the label. A double sided label can add dimension to the product or increase the surface that is adhered to the product to allow more information that could not fit into the space of the outer layer to be added. It can either be printed on the adhesive side or on the non self-adhesive substrate first, and the adhesive is applied later over the printed area. This allows us to use unlimited number of colours to be printed on both sides of the label and to combine any substrates to print double sided labels. Double sided labels can be used as promotional labels and be attached to shop windows or windscreens as an element of a promotional or awareness raising campaign. NFC integrated on a label. The popularity of the NFC system has made us integrate NFC into the portfolio of our products. NFC tags become increasingly popular and commonplace and can be attached to a wide range of products. If so, then why not use them on labels? 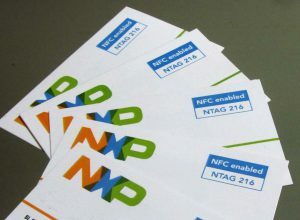 NFC tagged labels are possible to manufacture and Comex knows how to do it. In anticipation of your enquiry, we have introduced NFC tagged labels to our product portfolio, thereby allowing them to be placed on your products. Contact RFID department to get more details. 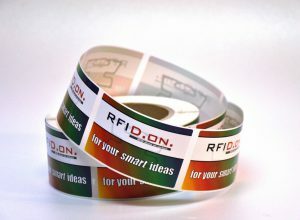 RFID integrated on a label, ticket or card. RFID systems hold no secrets from us. Keeping in mind our most demanding customers, we commissioned the first and so far the only integrated production line in Poland that allows a chip and an antenna to be directly applied onto a label along with a print of your choice. We select solutions according to customer offer’s specifications. The product enters mass production once the test phase has been completed. The chip or antenna are integrated on the label or other product and the omission of the INLAY application stage makes the solution more cost-effective compared to other commercial solutions. We offer a wide range of solutions. We set trends in customized RFID technology that is tailor made to your business requirements. For details contact our RFID Department. COMEX guarantees the highest quality and availability of multiple printing techniques. Compatible hybrid printers offer limitless possibilities of combining several printing processes on a single finished product.